Diane rang us up the other day and told us one of her sons had been playing around with the family iPad when it slipped out of his hands and landed on the tile floor. The result you can see in the picture. 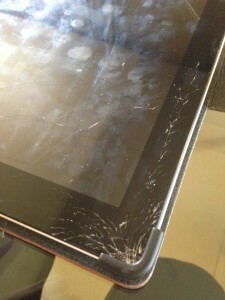 The left side of the iPad 3 experienced a break with a few pieces of glass actually coming off the screen. The cracked iPad glass was sharp and could quickly hurt somebody if Diane wasn’t care. She had seen someone with cracked iPad glass before and wondered if that had ever decided to get the screen replaced. Now, she was in the same situation – wondering if there was a company in Abu Dhabi or Dubai that could replace the cracked iPad glass on her son’s iPad 3. She would hate for him to have to bring it into school looking like that. And she was concerned that he would chop off one of his fingers if he was careful. That is no way to have an iPad, she thought. The iPad still worked, but as you can see it did not look pretty. Diane was in need of getting the glass digitizer screen replaced on her fairly new iPad. She began looking around and asking some of the other folks who lived in her neighborhood if that had any idea as to how to go about fixing this problem. Were there any Apple service centers in Dubai or Abu Dhabi that would be able to help? Fortunately, she stumbled upon a wonderful repair service that provided the convenience of meeting her at the family’s home and replacing the screen at the kitchen table. We set up an appointment to meet her at her house in Khalifa City A in Abu Dhabi. We sat right down at her dining room table and had it repaired in about 45 minutes. Back to normal, good as new!